WSO2 Enterprise Integrator encompasses a plethora of integration capabilities packaged into a single product. 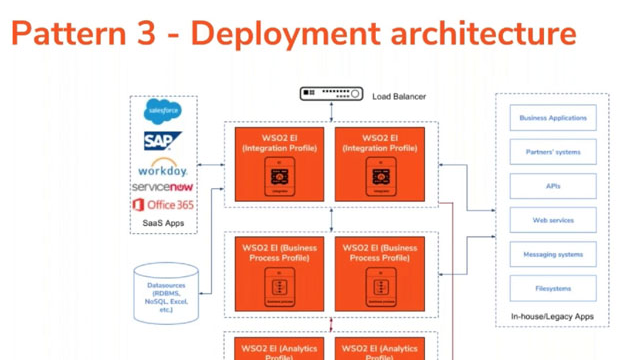 For real-world deployments of WSO2 Enterprise Integrator, these capabilities or profiles need to be properly architected based on your requirements. From our experience with customer requirements, we have identified common and reusable deployment pattern for WSO2 Enterprise Integrator. When an API gateway enforces API governance policies, it connects with several other API management components. But there are cases where the API runtime traffic needs to be isolated from the API management traffic. For that, WSO2 has introduced WSO2 API Microgateway. API Microgateway is a lightweight message processor for APIs which supports authentication, authorization, throttling, and analytics. API microgateway goes well with microservice architecture due to its lower startup time, lower resource consumption and the native support for container-based deployments. The API microgateway can be run in a fully controlled environment using a selected set of APIs. WSO2 Enterprise Integrator is considered as one of the most robust integration solutions available in the market. Even though the product is designed to target failure-free operation (reliability) and resiliency, it is hard to expect a system to operate in a 100% stable manner all the time. There can be intermittent failures from time to time due to various reasons like transient network failures and lack of resources. It is very important to understand how to troubleshoot when such an issue happens. It’s equally important to design, develop, test, and deploy WSO2 Enterprise Integrator by following best practices to obtain the optimum output and prevent possible issues in the production system. This webinar will discuss how to troubleshoot an issue in WSO2 Enterprise Integrator and follow best practices in order to optimize output and avoid failure. Modern day organizations need to connect to various systems in order to perform their day to day operational tasks. As they integrate with more systems and develop large applications, it gets harder to keep track of what is going on within the system. An exposed API can take too much time to respond, the request rate for a service can increase unexpectedly or an endpoint may fail, disrupting day-to-day operations and creating unsatisfactory user experience. It’s necessary to analyze historical data about a system in order to understand the system behavior and plan the relevant modifications. Observability is the answer to all these problems. WSO2 Enterprise Integrator provides a comprehensive set of observability features useful for monitoring current operations, collecting and analyzing historical data and triggering alerts if something unusual happens. The heterogeneous nature of today’s systems makes integration a vital part of the software development cycle. While moving away from monolithic architecture provides many advantages, it’s also important to drive focus towards some common characteristics that need to be considered when integrating between heterogeneous systems and services. One of the primary concerns would be the types of tools offered for developers to integrate between systems and services and how these tools help to manage, debug and troubleshoot various integration use cases. Microsoft Office 365 is a successful and continuously growing enterprise solution - and a pivotal one given it’s widespread usage. IT infrastructures of enterprises are so complex, migrating to the cloud might require a lot of time and effort. Customers have limited datastore options and often it is required to migrate user stores of the entire enterprise. Office 365 requires users to be present in the Microsoft cloud, pushing enterprises to keep their user stores within the Microsoft cloud. Integration becomes more complex when the current system is not compatible with the tools supported by Microsoft. With the proliferation of APIs exposed, number of users through mergers and acquisitions and the increasing need for privacy, IAM is now more than a security project. It’s an enabler for an integration agile enterprise. The world before 2004 had no Facebook, Instagram or Twitter. 15 years later, one of the constant debates we face is if we should opt for centralized or decentralized identity given the reality of privacy and security breaches. Standards continue to evolve. MFA is being replaced by continuous and adaptive authentication. Over 5BN currently use mobile devices, converting digital identities into currency. So how should you prepare for 2019 and the coming years? If you’re currently evaluating an Identity solution or exploring IAM, this webinar is for you. In the past, the concept of username and password was sufficient to authenticate a user. With the growth of online businesses, users and the increased room for identity theft, we need far more advanced mechanisms. Multi-factor Authentication (MFA) emerged as an answer to this problem where it created a layered defense and made it more difficult for an unauthorized person to access a target such as a physical location, computing device, web service, network or a database. However, even though multi-factor authentication provided additional and better security for enterprises, there are practicality issues with the implementation given the need for increased convenience for users. This webinar will explore the emerging of MFA, the pitfalls, why you should upgrade your MFA and best possible alternatives for MFA. 2018 was the year for open source with billions invested and spent across every category of enterprise software. This momentum capped another successful year for WSO2 where we added a record number of new customers, partners, and open source contributors who collectively used WSO2 products to drive 6 trillion transactions! Integration has become the hottest segment in enterprise software. Every organization is becoming digitally-driven and now have API-first initiatives to transform their legacy apps, connect services, create omnichannel experiences, simplify business intelligence, and to become more agile. WSO2 takes extra pride in our recognition as the open source leader in the 2018 Forrester Wave for API Management, and are excited to celebrate this accomplishment with our many customers and partners. Join WSO2 chief executive officer, Tyler Jewell, for a review of our 2018 performance and ambitions for 2019. He will discuss market shifts, our product plans, and financial investments that are working to turn WSO2 into one of the world’s largest integration companies. The impact of the General Data Protection Regulation (GDPR) is not limited to organizations operating in the EU. It also affects those that operate in other countries but do business with individuals living in the EU. To become compliant, organizations are expected to re-evaluate their data protection and privacy policies, business processes and systems used to process personal data. Organizational success depends on our ability to sense the environment, grab opportunities and eliminate threats that are present in real-time. Such real-time processing is now available to all organizations (with or without a big data background) through the new WSO2 Stream Processor. Most modern systems support integration with other systems through APIs that are exposed over well-known protocols and standards. However, it is hard to expect all the existing systems of an organization to be capable of integrating with other systems. Legacy systems will eventually get replaced by new smart systems, even though it takes time. Nevertheless, organizations may not want to wait for another few years to get the new systems in place to continue their digital transformation journey. Therefore, the challenge is to drive all these existing systems towards brownfield integration. The healthcare system in the US is complex, incentive driven, and highly fragmented. Poor coordination in a fragmented system has resulted in serious medical errors that have cost lives. Most organizations realize that one way to mitigate such errors is by sharing accurate and up-to-date patient information. Yet, healthcare IT (HIT) systems from different organizations are not integrated, leaving room for gaps in critical information. To bridge these gaps, the Institute of Medicine (IOM) has drawn up new guidelines for a patient-centric system enabled by the implementation of a connected ecosystem among healthcare organizations. Building a sustainable platform goes beyond just technology. Ensuring digital innovation, participation and agility from both internal and external stakeholders of a platform require platform design that takes into account the needs of producers and consumers of services and solves them via a technology platform. APIs are a key part of this platform-driven digital innovation, enabling organizations to expose internal assets in a controlled manner to various stakeholders whilst enabling the community to build innovative applications consuming these services. API platforms provide the core technology for sharing these APIs. Many organizations are taking steps towards becoming compliant with the upcoming EU General Data Protection Regulation (GDPR) before the May 2018 compliance date. But only a few are considering user experience (UX) aspects of GDPR compliance, which is of paramount importance in order to gain a competitive edge. A sound UX strategy tied with GDPR compliance will enable organizations to use personal data privacy as a differentiator in the market to attract new customers and retain existing ones. It is necessary to consider privacy as a key ingredient of your UX at the initial stages itself. Enterprises are increasingly looking at how they can extend their business through external APIs in their digital transformation journey. However, to truly reap the benefits of an API program, organizations need to move beyond basic API management to creating API marketplaces that promote the consumption and use of APIs to deliver new apps and services. - What is an API marketplace? - What's next after an API marketplace? The shifting of enterprise applications to the cloud, the proliferation of devices and the diversity of users, have forever changed the landscape of identity and access management (IAM). We have witnessed organizations of all sizes and verticals increasingly realizing the importance of and heavily investing in fine-tuning their IAM strategy to solve workforce to SaaS, on-premise workforce, customer and B2B IAM use cases. Now, we need to look at what the immediate and long-term future holds in store for IAM. - Is Identity of Things challenging? - Is Blockchain Identity the future? APIs are a key foundation of digital transformation. This session discusses API management designs and best practices, their benefits and drawbacks and how APIs can assist an enterprise in their digital transformation journey. The General Data Protection Regulation (GDPR) is a crucial aspect for most businesses. The latest release of WSO2 API Manager provides organizations the capabilities to instantly become GDPR compliant, accelerate digital transformation efforts by leveraging the benefits of this regulation, and become more efficient. The spring release has a number of new features and improvements. We have introduced many security-related improvements and support for OpenAPI 3.0, which is the latest specification of Swagger. The access control for APIs in the API publisher and application sharing among multiple groups in API store have been important changes for API and application developers for collaborative developments. In the age of the customer, businesses battle to retain the trust and loyalty of existing customers as well as to win new customers in the phygital (physical and digital) space. Customer Identity and Access Management (CIAM) is an essential weapon, which you must wield to win this battle. But the difficulty is that the conditions of the battleground are dynamic and the targets are moving fast. If your CIAM solution is undesirably restrictive, it can detract from the customer experience. On the other hand, if it’s not restrictive enough it compromises your security. Finding out the right balance for your business can be challenging. Most organizations don’t have the technical capacity to build a CIAM solution in-house that’s dynamic, flexible, and scalable enough to compete in the market. On the other hand, complex multi-vendor solutions are hard to integrate, customize, and scale up to your business demands. By adopting the right technology, following best practices and avoiding common pitfalls, you’ll be able to create a strong CIAM solution. With WSO2 Identity Server, you have the ability to implement a lean, extensible, scalable, and developer-friendly solution that is able to meet the core requirements of CIAM. WSO2 is the world’s #1 open source integration vendor, and a Leader in the Forrester Research API Management Wave Q4 2018 report. We help digitally driven organizations become integration agile; customers choose us for our integrated platform, our approach to open source, and our agile transformation methodology. Today, 100’s of leading brands and 1,000’s of global projects execute 5 trillion transactions annually using WSO2 integration technologies. Visit https://wso2.com to learn more.